7 Nights Accommodation at Fattoria Le Giare, in a traditional Tuscan villa in the beautiful surrounds of Cortona where the famous "Under The Tuscan Sun" movie was filmed.Twin double beds for 2 guests. Single supplement available. Exclusive Under the Tuscan Sun gift bag. Includes Under the Tuscan Sun book signed by author Frances Mayes, sunflower pendent and a bottle of wine from Bramasole, the famous villa from the famous novel and film; "Under the Tuscan Sun". Explore Cortona town with a special "Under the Tuscan Sun" guided walking tour to visit all the sites shown in the popular film. Authentic Italian cooking class with chef, Donatella, in a Tuscan villa dating back to the 1500's. Vespa ride from Cortona to Montepulciano in the Val d'Orcia region. Visit to a 3rd generation, underground jeweller in Cortona. Learn the art of jewellery making whilst wearing beautiful jewellery pieces during dinner. Spa Day at nearby Wellness Resort & Spa in Cortona. Enjoy a 30 minute massage and relax with a Turkish bath, Finnish sauna, salt rooms and pool area. 5 x light lunches. Enjoy pizza, panini, salads etc. 7 x dinners. 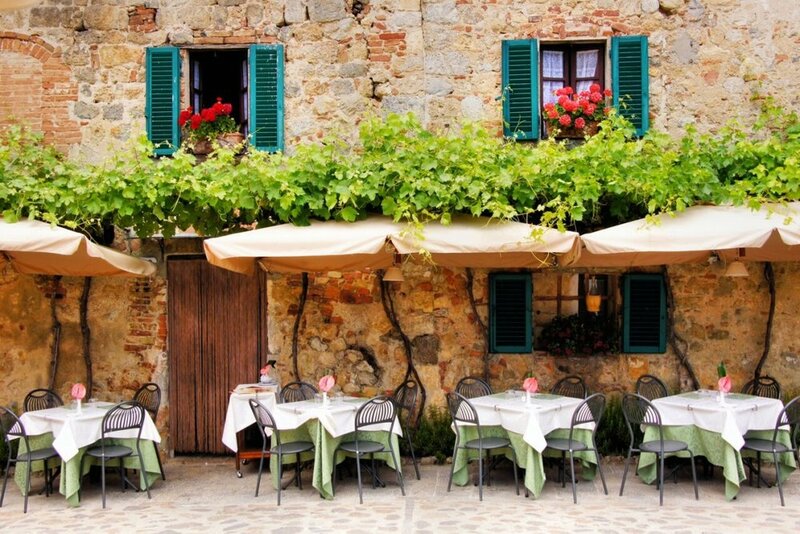 Eat like a local in traditional Italian trattorias or restaurants. Enjoy each dinner with a glass of vino. 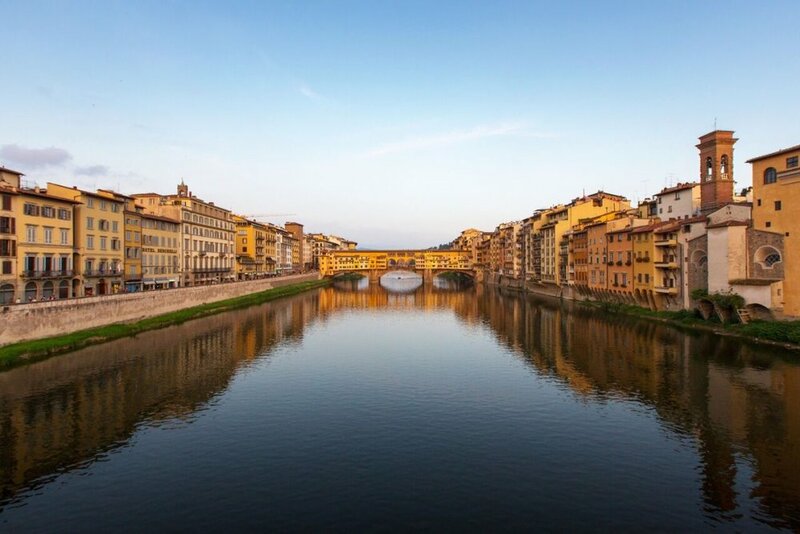 Luxury vehicle transportation + train tickets for independent travel to Florence. Return transfers to local train station on arrival, departure and free days. Saturday 24 August - 31 August 2019. • 2 Bedroom apartment for 2 guests. • Single supplement - own apartment. Prices include EUR taxes, and subject to changes with currency variations. Vespas, Vineyards & Vino is a Travel Meet Up designed to bring together a small group of Tuscan lovin’ ladies who wish to experience the region as true locals. What better way to become a local then to say ‘Ciao!' to your two bilingual host’s and GG Sister’s, Monique and Ines. These two lovely Tuscan ladies know the region inside out and are ready to share with you all the best bits of Tuscany that only a true local would know! We’re talking visits to family vineyards and olive groves, a cooking class with the oh-so-amazing chef, Donatella in a 15th century villa, and guaranteed lively conversation (outrageous hand gestures and all) with your new Italian amici. To set the scene, you will stay 7 nights in an authentic Tuscan stone villa, similar to what you may have seen in the famous film “Under the Tuscan Sun”, mainly because Fattoria Le Giare is located in the surrounding countryside of Cortona, the exact village that the movie was filmed in. Downtime at your villa involves poolside relaxation featuring breathtaking views of the rolling Tuscan hills. For all those ladies whose Tuscan dream was inspired by the novel and film “Under the Tuscan Sun”, you will love GG’s “Under the Tuscan Sun” day tour where you’ll explore the popular sites of Cortona as seen in the film. You’ll also love your new "Under the Tuscan Sun” gift bag which includes the signed novel by author; Frances Mayes, a gorgeous sunflower pendant and a bottle of vino from Bramasole- the famous villa where main character, Frances stays in Tuscany. 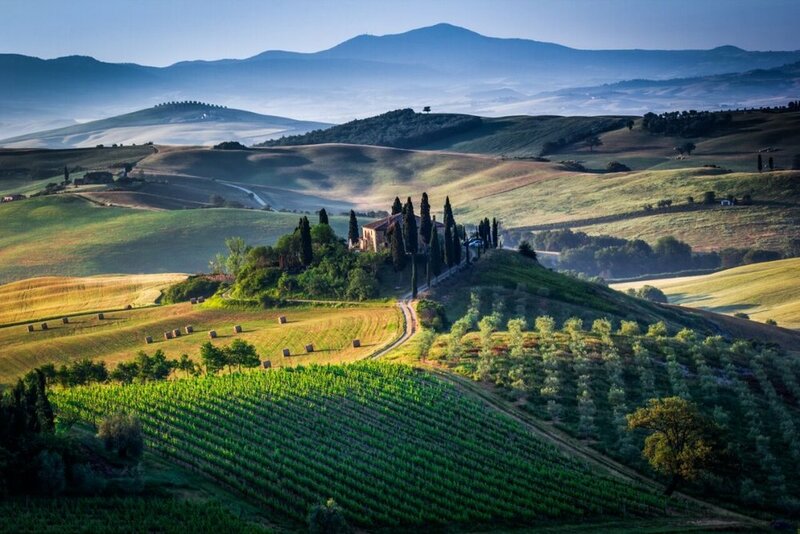 Many hours will be spent wine tasting, cheese tasting and eating like a local, which of course, always means a glass of vino in hand at some of Tuscany’s most jaw dropping locations. Sam Gimignano and Chianti are two of our fave spots visited. Of course, for those shopaholics, you are not forgotten, our tour features a visit to a 3rd generation, underground jeweller where you’ll learn the art of jewellery making and dine in your favourite piece of jewellery. Further shopping opportunities on your independent day trip to Florence, the city famous for its leather. No trip to Italy is complete without a vespa ride. If you’re feeling adventurous, ride your own vespa, or simply relax, sit back and enjoy the breeze as you let an experienced vespa rider lead you through the beautiful Val d’Orcia region.